As the eyes age, problems with vision become more common. 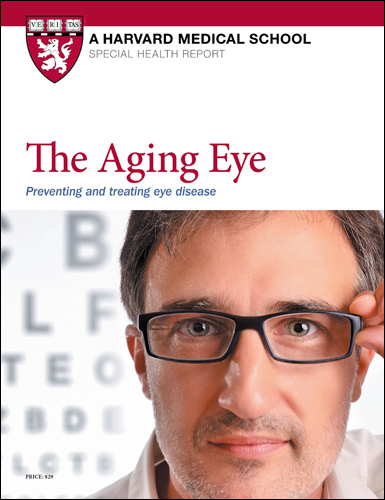 The Aging Eye: Preventing and treating eye disease explains how to recognize the risk factors and symptoms of specific eye diseases — cataract, glaucoma, age-related macular degeneration, and diabetic retinopathy — and what steps you can take to prevent or treat them before your vision deteriorates. Although aging puts people at greater risk for serious eye disease and other eye problems, loss of sight need not go hand in hand with growing older. Practical, preventive measures can help protect against devastating impairment. An estimated 40% to 50% of all blindness can be avoided or treated, mainly through regular visits to a vision specialist. Regular eye exams are the cornerstone of visual health as people age. Individuals who have a family history of eye disease or other risk factors should have more frequent exams. Don't wait until your vision deteriorates to have an eye exam. One eye can often compensate for the other while an eye condition progresses. Frequently, only an exam can detect eye disease in its earliest stages. You can take other steps on your own. First, if you smoke, stop. Smoking increases the risk of several eye disorders, including age-related macular degeneration. Next, take a look at your diet. Maintaining a nutritious diet, with lots of fruits and vegetables and minimal saturated fats and hydrogenated oils, promotes sound health and may boost your resistance to eye disease. Wearing sunglasses and hats is important for people of any age. Taking the time to learn about the aging eye and recognizing risks and symptoms can alert you to the warning signs of vision problems. Although eyestrain, spending many hours in front of a television or computer screen, or working in poor light do not cause harmful medical conditions, they can tire the eyes and, ultimately, their owner (see below). The eyes are priceless and deserve to be treated with care and respect — and that is as true for the adult of 80 as it is for the teenager of 18. Fact: Although dim lighting will not adversely affect your eyesight, it will tire your eyes out more quickly. The best way to position a reading light is to have it shine directly onto the page, not over your shoulder. A desk lamp with an opaque shade pointing directly at the reading material is the best possible arrangement. A light that shines over your shoulder will cause a glare, making it more difficult to see the reading material. Myth: Eating carrots is good for the eyes. Fact: There is some truth in this one. Carrots, which contain vitamin A, are one of several vegetables that are good for the eyes. But fresh fruits and dark green leafy vegetables, which contain more antioxidant vitamins such as C and E, are even better. Antioxidant vitamins may help protect the eyes against cataract and age-related macular degeneration. But eating any vegetables or supplements containing these vitamins or substances will not prevent or correct basic vision problems such as nearsightedness or farsightedness. Myth: It's best not to wear glasses all the time. Taking a break from glasses or contact lenses allows your eyes to rest. Fact: If you need glasses for distance or reading, use them. Attempting to read without reading glasses will simply strain your eyes and tire them out. Using your glasses won't worsen your vision or lead to any eye disease. Fact: Although using a computer will not harm your eyes, staring at a computer screen all day will contribute to eyestrain or tired eyes. Adjust lighting so that it does not create a glare or harsh reflection on the screen. Also, when you're working on a computer or doing other close work such as reading or needlepoint, it's a good idea to rest your eyes briefly every hour or so to lessen eye fatigue. Finally, people who stare at a computer screen for long periods tend not to blink as often as usual, which can cause the eyes to feel dry and uncomfortable. Make a conscious effort to blink regularly so that the eyes stay well lubricated and do not dry out.